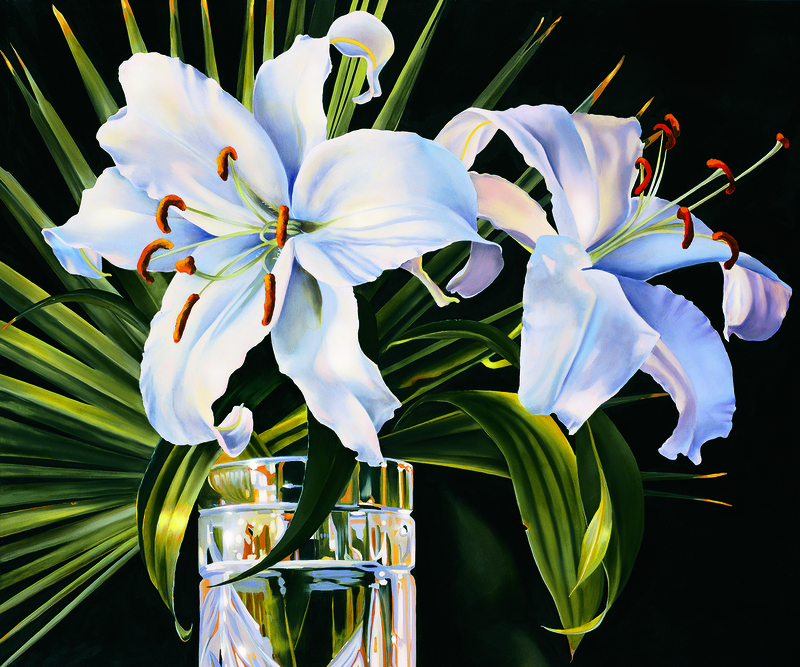 Casablanca Lilies, 2008, by Ora Sorensen. Oil on canvas, 36" x 30". Recently I received a beautiful email from a stranger. It was written by a woman who was visiting with her husband in a hospital in Ohio. She told me that while her husband has been in the hospital, two of my paintings were in his room, and she said my paintings had been a focus of meditation and solace. She thanked me for expressing my talent and for sharing it, saying that I brought her joy. I was very moved by the email, and the fact that a wonderful woman made the effort to write to me during a difficult time for her and her husband. This was the most endearing compliment I have ever received regarding my artwork. Bringing joy or solace to others was not something I thought of when I painted, so this unexpected email touched me deeply. A study done in 1984 compared two similarly treated groups of patients who were recovering from cholecystectomy: One group looked out onto trees and nature landscapes, and the other looked onto a brick wall. The “tree” group recovered in 7.96 days on average while the “brick” group took 8.70 days. This may not seem like a significant difference when accounting for other factors of the healing process, but it definitely deserves further research to examine. Since then, further studies have been conducted to assess the impact art has within hospitals. In 2006, it was stated by the Department of Health Working Group on Arts and Health that art has a “clear contribution to make and offer major opportunities in the delivery of better health, wellbeing and improved experience for patients…” In a study conducted across three UK hospitals, paintings were classified in terms of pleasure and arousal. Those with high levels of pleasure and low arousal induced states of calm within patients, while others with high arousal and low pleasure caused discomfort. Patients all-around preferred paintings of landscapes, confirming the research findings from decades before. A possible reason for the preference of nature and landscapes is because it takes us back to an escape from urbanization and the desired arcadia of simpler times. The blue and green calming hues of nature paintings were more likely to assist patients than modern art of geometric figures. Within the “art of medicine,” there are psychological healing aspects that science still cannot determine the root causes. Pleasurable art within hospitals can have positive effects on health outcomes, shorter lengths of staying in hospitals, increased pain tolerance, and decreased anxiety according to a study titled “Visual art in hospitals: case studies and review of the evidence.” For more information, read the study’s findings here. Not only does the type of art matter in the healing process, but it also depends on where the art is located. Our minds process stimuli everywhere around us, even if we are not consciously aware of it. The hospitals in the 2006 study took care to put art wherever they could, including the parking garage (which also helps to remember where your car is), the windows, and the wards and waiting rooms. These are all important to establish a sense of comfort to those visiting the hospital, regardless of how long they stay there. Hamish McDonald, an artist and cancer patient at one of the examined UK hospitals said this about art: “I am a firm believer in the power that art has to inspire and help alleviate suffering and that it can play a key role in lessening the burden that illness brings.” His art depicting life with cancer can be seen at the Medical School Building in Glasgow.